As far as Transformers films go, Bumblebee ranks among the better of the group in the series. Since 2007 audiences have had the pleasure of watching a Saturday morning cartoon come to life in the form of Transformers. These autoboot, alien creatures came to Earth seeking a place to hide from the evil forces that looked to destroy them. Over five films spread across a dozen years, we have gotten to know Optimus Prime, Bumblebee, Megatron and all the autoboots. While all the films tended to focus on Optimus as the Autobot leader and the quest to save earth from villains, last year's feature, Bumblebee, told the story of how the cute, little yellow bot came to earth. After a long fought battle, Cybertron was falling to the Decepticons and the autoboots needed to escape. Optimus Prime tasked his soldier B-127 to go to Earth to see if it was suitable for the new Autobot base camp. Unfortunately, some of the Decepticons followed B-127 and damaged his voice box so he couldn't communicate with the American military member who located him. Meanwhile, Charlie Watson (Hailee Steinfeld; The Edge of Seventeen) lives in California with her Mom and stepdad after her father tragically passed away from a heart attack. Once a High School diving champion, Charlie now spends her free time in the garage trying to repair her father's beloved vintage car; a hobby the two of them used to share. One day at the junkyard Charlie sees an old Volkswagon beetle and asks if she can have it. When she gets it home and inspects it she finds it comes to life. Nicknaming the car Bumblebee she spends time with him and the two become close. However, unbeknownst to them, Decepticons have tracked B-127 to Earth and have befriended the United States government in order to trick them. With the Decepticons heading to Bumblebee to destroy him, the other Autobots arrive on Earth to save their friend and the whole planet. Steinfeld is a terrific young actor and she shines here as a damaged, rebellious teenager who longs for her former life and her father. Her range of emotions upon meeting the alien creature is reminiscent of a veteran actor. She is joined by Jorge Lendeborg Jr.; Spider-Man: Homecoming) who plays her nerdy neighbor that has a crush on Charlie. Lendeborg Jr. adds some comic relief and plays his part well. John Cena (Trainwreck) plays US Soldier Burns who first encounters Bumblebee and hunts him until Burns realizes Bumblebee isn't the enemy. Whoever keeps giving Cena acting roles should just stop. He is a low point of this otherwise solid cast. It's easy to see the excellent video quality of this film when the main character is a bright yellow car. The colors are vibrant and crisp and the landscape is beautifully depicted. The Dolby Atmos audio is outstanding and envelopes the viewer from all sides. The explosions boom and rattle you right down to your core for a truly memorable experience. The 4K combo pack comes with 2 discs and a digital download as well as a Sector 7: The Battle of Half Dome comic book. The extras are housed on the Blu-ray disc and include: Sector 7 Archive – Agent Burns: Welcome to Sector 7, Sector 7 Adventures: The Battle at Half Dome, Deleted and Extended Scenes, Outtakes, Bee Vision: The Transformers robots of Cybertron, and the multipart Bringing Bumblebee to the Big Screen. As far as Transformers films go, Bumblebee ranks among the better of the group in the series. Director Travis Knight (Kubo and the Two Strings) does an excellent job of blending action and comedy with a serious story. His pacing is very good so the audience never feels neither bored nor rushed. If you are a Transformers fan, you will definitely want to own this film. 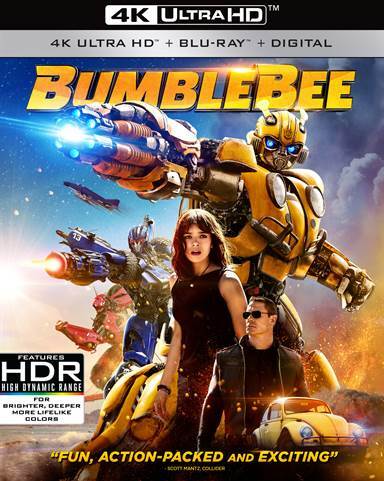 Download Bumblebee from the iTunes Store in Digial HD. For more information about Bumblebee visit the FlickDirect Movie Database.